Ever go to a top-notch Italian restaurant that had unique, creative dishes? The kind of place where everything sounded good and it was hard to decide? If so, you probably didn’t order the pasta with meat sauce. But if you had, it might have been the best dish there. I did that once, and it was so good that I was determined to re-create it at home. I present you with the best meat sauce. Ever. 1. Preheat a skillet on medium-high heat and add the olive oil and crushed red pepper. Once the oil thins out, and before it begins to smoke, add the onion and garlic and saute for 2 minutes. Add the beef and cook for 1 minute. Break apart the meat with a spatula and cook until well done, about 5-7 minutes. Drain the beef. 2. Return the skillet to medium heat and add the crushed tomatoes, wine, olives and capers (if using), and remaining seasonings and bring to a boil. Lower the heat and simmer for 20 minutes. Meanwhile, cook the pasta according to the directions on the box. 3. 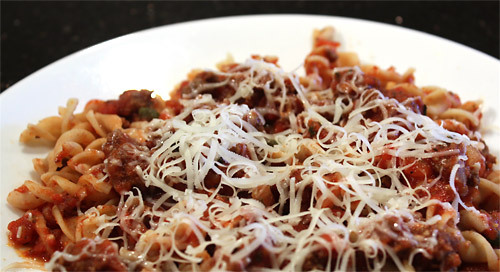 Serve the sauce over the pasta and top with fresh parmigiano-reggiano. Nice- you came up with this all on your own? Capers and red wine? Unusual ingredients for a meat sauce! Do you think those are what makes it so good? Yes, I’m intrigued by the capers also! It adds just a little something extra! A little saltiness, a little color. We should have made this last weekend!!!! Next time. i LOVE adding slightly unusual stuff to traditional sauces. well done! this is on my to-try list! Sounds delicious, but like the others-Capers? I’m going to follow my sisters advice-she always tries a new recipe exactly as given and either tweaks if needed, keeps as is or tosses it out. I’m positive I won’t end up with the last idea.